This photo provided by the U.S. Coast Guard shows the Coast Guard cutter Rush, left, monitoring the disabled ship Cougar Ace, 240 miles south of Adak, Alaska, in the North Pacific Ocean on Tuesday. Company officials say the Cougar Ace was thrown sideways when the massive ship's ballast tank was adjusted in the open seas of the North Pacific. Coast Guard officials said the Honolulu-based cutter Rush will remain at the remote site until a salvage tow arrives next week to retrieve the Singapore-flagged ship. ANCHORAGE, Alaska » A disabled, crewless ship loaded with nearly 5,000 autos has crossed into U.S. waters, drifting yesterday toward Alaska's Aleutian Islands. The Cougar Ace was still listing sideways as it floated in choppy seas about 150 miles south of Atka Island, the Coast Guard said. 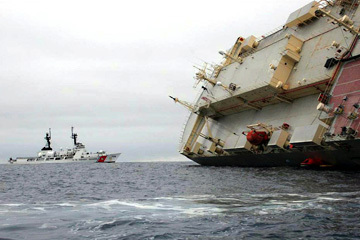 The 654-foot car carrier had zigzagged 120 miles since it tilted sharply Sunday night, its crew rescued 24 hours later, said Petty Officer Richard Reichenbach. The Coast Guard cutter Rush was tracking the ship as it slowly moved northeast. "There's always concern, but we do have an asset on scene," Coast Guard Lt. Heather Neely said. "We're doing all we can and it's not drifting very fast." The ship's owner, Tokyo-based Mitsui O.S.K. Lines, sent out a tug yesterday morning with a salvage engineer on board from Dutch Harbor on Unalaska Island about 400 miles away. The goal is to secure the vessel's cargo of mostly Mazda vehicles as soon as possible, said company spokesman Greg Beuerman. The cars are stacked 14 stories high. A salvage tow from Seattle is expected to reach the Cougar Ace no earlier than Wednesday, while the Dutch Harbor tug is expected to arrive this morning. The engineer en route yesterday will work on a plan to regain stability for the ship for towing it to a yet undetermined port, Beuerman said. The Singapore-flagged ship began listing Sunday night in international waters about 230 miles south of Adak Island, also in the Aleutians. The Cougar Ace likely had discharged too much water from ballast tanks at the bottom of the vessel, causing it to suddenly list in the space of 10 minutes, according to Beuerman. He said company officials believe the ship rolled on the swell of the sea while the crew was adjusting the ballast tank, which regulates the ship's weight and balance. The 23 crew members were hoisted to safety Monday night, many bruised and cut up from the abrupt tilting of the ship. The worst injury was a broken ankle. The ship has been drifting, and shifting winds late Wednesday began pushing it toward land. Unknown is the fate of the cargo secured inside. The cutter Rush hoped to hook a line to the Cougar Ace this morning to slow its drift, Neely said. The Honolulu-based cutter, however, is not equipped to tow the ship. Mitsui issued a statement apologizing for "any inconvenience this incident has caused" and thanking the Coast Guard and Alaska Air National Guard for their efforts.